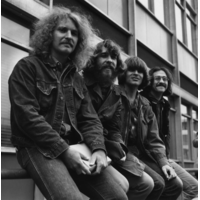 Creedence Clearwater Revival (often abbreviated CCR) was an American rock band that gained popularity in the late 1960s and early 1970s with a number of successful singles drawn from various albums. The group consisted of lead vocalist, lead guitarist, and primary songwriter John Fogerty, his brother and rhythm guitarist Tom Fogerty, bassist Stu Cook, and drummer Doug Clifford. Their musical style encompassed rock and roll and swamp rock genres. Despite their San Francisco Bay Area origins, they positioned themselves as Southern rock stylists, singing often about bayous, the Mississippi River, catfish, and other popular elements of Southern iconography. CCR's music is still a staple of American and worldwide radio airplay and often figures in various media. The band has sold 26 million albums in the United States alone. CCR was inducted into the Rock and Roll Hall of Fame in 1993.